Microsoft recently announced in ablog post. “Windows 10 IoT delivers innovation and intelligence at the edge with the October 2018 Update” The Windows 10 October 2018 update will deliver ‘edge’ intelligence with machine learning, industrial strength security, new silicon options, and additional monetization models for distributors and sellers for enterprise Internet of Things (IoT) projects. The edge” is a theoretical space where a data center resource may be accessed in the minimum amount of time. The edge, in simple terms, is where you generate, collect, and analyze data i.e. where the data is generate. Edge computing technology is applied to smartphones, tablets, sensor-generated input, robotics, automated machines on manufacturing floors, and distributed analytics servers that are used for “on the spot” computing and analytics. •	when the computation required for rendering the content is carried out close enough to AR and VR devices. •	In IoT, many analytical actions need to be carried out closed to the devices that generate the source data. •	HD video content, if cached closer to large concentrations of people who’re likely to access it, means that providers can avoid large costs of transmission over networks provisioned by third-party carriers. •	Critical infrastructures such as oil and gas facilities require the highest levels of precautions to avoid system failures that could escalate into catastrophes. Edge computing allows for data from temperature and humidity sensors, IP camera, pressure and moisture sensors, and handheld devices. The data is analyzed, processed, and then sent back to users in near real-time, helping them prevent malfunctions. Edge computing is all about achieving geographical distribution so that computing power can be taken closer to the endpoints that need it most. So, instead of only relying on a dozen giant datacenters, edge computing provides for the cloud to come closer to places/people/devices where there’s a business case for reducing response times even by a few hundred microseconds. Critical security and safety systems always need to function on premises. You need these systems to operate or fail in a safe state regardless of what happens to the cloud or the connection. The simplest on-premises approach is a big red shut-off button on each machine. Azure IoT Edge enables a more complex safety system. Example: You monitor the temperature across a range of machines and if the combined temperature gets too high you need to shut down all machines to prevent damage or risk to human operators. A safety system at the level of the individual machine is not enough, because it can’t track combined temperature across multiple machines. Your safety system needs to be one level higher to monitor and control multiple machines, and you can do this with Azure IoT Edge. •	By 2020, it’s expected that there will be more than 5,600 million smart sensors and connected IoT devices across the globe. •	The data generated by these devices will be to the tune of 5,000+ zettabytes. •	The IoT market size is expected to reach $724 billion by the end of 2023. Most of this data will be generated at enterprise endpoints located on the “edge” — such as sensors, machines, smartphones, wearable devices, etc. We can consider these to be located on the “edge” because they’re far away from the central datacenter of the organization. This massive data can’t simply be relayed to the central server because it will overwhelm the entire network. Enterprises will implement edge computing so that massive data doesn’t have to be transported to corporate datacenters. Instead, advanced operational analytics will happen at the remote facilities, to enable site managers and individuals to act in real time on the available information. •	A Long-Term Servicing Channel, provides security and quality updates without any new features over a 10-year period. The long-term model is ideal for commercial IoT devices, including point-of-sale systems, ATMs, and industrial equipment controllers, which all require strong security and fewer feature updates. A new cloud service subscription, called Windows 10 IoT Core Services, offers companies the services to commercialize a device on Windows 10 IoT Core, including both long-term OS support, and services to manage device updates and assess device health. This will help device manufacturers to lower support costs, and will help distributors create better business models to create customer value. Windows Machine Learning allows developers to use pre-trained machine learning models in their applications, which can be evaluated and adjusted as needed at the edge. Microsoft also added support for NXP i.MX 6, 7 and 8M series processors to Windows 10 IoT Core. Windows 10 IoT also includes turnkey support for both Azure IoT Device Management and Microsoft Intune to provide more scalable device management for enterprise IoT deployments. The acatech Industrie 4.0 Maturity Index is a six-stage maturity model that analyses the capabilities in the areas of resources, information systems, culture and organisational structure that are required by companies operating in a digitalised industrial environment. Dubai Police are launching a new campaign – Cross Safely – which will run for three months to educate pedestrians, particularly labourers. In case you are wondering, the fine for unlawfully crossing a road is Dhs200 and 65000 people were fined last year and more sobering 46 were killed by crossing at non designated spots. That’s almost one a week. Gulf Educational Supplies and Solutions (GESS) opened yesterday and is being held under the patronage of his Highness Sheikh Mohammed Bin Rashid Al Maktoum, Vice President of the UAE, Prime Minister and Ruler of Dubai, in partnership with the Ministry of Education, GESS and Global Education Forum (GEF). In its 9th edition, GESS provides the ideal platform for education professional worldwide to meet, find new products and services, and discuss a range of topics about education and its future. H.E. Hussain Ibrahim Al Hammadi, Minister of UAE Ministry of Education, UAE and Synergy Software Systems Account Manager Sudhakar Raman at yesterday’s exhibition in Dubai. The event continues today and tomorrow. H.E. Hussain Ibrahim Al Hammadi was appointed Minister of Education in 2014 by His Highness Sheikh Mohammad Bin Rashid Al Maktoum, Vice-President and Prime Minister of the UAE and Ruler of Dubai. He is also CEO of the Emirates Advanced Investments Group of companies. Synergy Software Systems is a Microsoft President’s Club member and implements solutions for the Education sector, such as: specialised Admissions and Billing in Dynamics Ax, library system, classroom scheduling, as well as traditional enterprise solutions for finance, HR, payroll, CRM , T@A and the Office 365 suite of applications. Filehold – ask Synergy Software Systems about document management for the U.A.E. “We recommend FileHold as the best document management system for businesses using Windows. We chose FileHold from dozens of document management system options. FileHold is a self-hosted document management system for businesses using Windows computers. It has the same look and feel of programs you’re already accustomed to using, and the interface is designed specifically with Windows Explorer in mind. The filing structure incorporates the same cabinet, drawer, folder and subfolder approach that Windows uses. So, once the software is installed, employees should have no trouble grasping how to use and navigate it. We like FileHold’s clean interface. It isn’t cluttered with icons or images. All you see when logging in is the file library running down the left-hand side of the page and a search bar along the top. The majority of the page remains blank until you start filing, searching for or opening documents. This approach keeps you on the same page the entire time you’re using the system. Many of the other systems we examined force you to toggle back and forth between pages depending on the task you’re working on. The FileHold library structure is designed with Windows Explorer in mind. Adding to the system’s ease of use are the MyFileHold folders, which are placed on top of the general library of cabinets and drawers on the left-hand side of the page. The MyFileHold section features separate folders for employees’ “favorite” documents, their checked-out documents, any alerts or reminders they have, the files they recently accessed and the files they recently added to the system. This provides a quick snapshot of the documents currently being worked on and the files that need immediate attention. Each employee can customize various portions of the system with their personal preferences. This option isn’t offered by all of the document management systems we examined. When looking at specific documents, employees can choose the tools they want to be quickly accessible. Quick links can be added for a variety of tasks, such as adding files, linking documents together and checking out files. Additionally, you can choose the metadata attributes — like document type, version, number of linked files and the author — that are shown alongside the file’s name. Filing documents within the software is simple and can be done in many ways. You can drag and drop files already on your computer or network, as well as scan documents directly into the system. The Microsoft Office integration also allows you to add documents you are working on in Microsoft Word, Excel, Outlook or PowerPoint with just a click of a button. As a Dubai based company since 1991 we have formed relationships over the years with other local IT solution providers. We have always enjoyed good working relationships with SamTech. Therefore, it gives me great pleasure to congratulate them on making it into the Dubai SME top 100 ranking. On Sunday 15th Samir I. Abdul Hadi Founder & CEO of Sam Tech was honoured by Sheikh Ahmad Bin Mohammed Bin Rashid Al Maktoum, Chairman of the Mohammad Bin Rashid Foundation and President of the UAE National Olympic Committee, as SamTech made it into the Dubai SME100 ranking in its third cycle. It’s quite an achievement to be ranked as one of the top 100 SMEs in Dubai out of the 4,500 nominations for the year 2015.This time, they made it to the TOP 10. 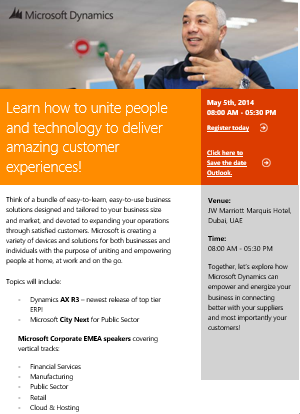 Join us at the first Dynamic Summit in the Middle East at JW Marriott Marquis Hotel, Dubai. Visit us at the Synergy Software Systems stand. Mimosa version 6.0 – We are pleased to announce a new update to Mimosa. This major upgrade to the application and help files changes the terms used in Mimosa. This makes it easier to understand for new users and for those wishing to use it in non-academic environments. However, the underlying process remains the same so, if you have already mastered Mimosa, you can continue to create your timetables with confidence. . In addition to the changed terminology there numerous usability improvements and fixes to some minor bugs to make this the best Mimosa release ever! Mimosa has a new web add-on, Mimosa Web, that that allows students to create their own custom timetables online from the courses you schedule with Mimosa? You no longer need to publish separate HTML files for each timetable. Just upload one file and have your students create their own personal schedule!